When the Job finishes building. The slave status becomes "Single-use slave has already been used and is pending removal." but the VM is still stale. gets deleted. if i do not interfere by force deleting the VM, it gets deleted after 10 Mins. The VM should get deleted instantly after the job finishes. How long should it take to the node offline and delete it ? Jenkins Guru added a comment - 2015-05-15 17:42 How long should it take to the node offline and delete it ? I tried using Single Use Slave Plugin to try and speed up the deletion process. However, it still takes 10 minutes. 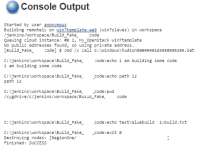 Jenkins Guru added a comment - 2015-05-15 18:44 I tried using Single Use Slave Plugin to try and speed up the deletion process. However, it still takes 10 minutes. Should be fixed now in git. Single-use JClouds-slaves ar now usually removed much faster. Please note however, that removal is postponed until they are completely idle, which might not be obvious if they are executing FlyWeight tasks. Fritz Elfert added a comment - 2016-11-15 21:58 Should be fixed now in git. Single-use JClouds-slaves ar now usually removed much faster. Please note however, that removal is postponed until they are completely idle, which might not be obvious if they are executing FlyWeight tasks.